Located in the southern Cambodia, near the Gulf of Thailand, about 240 km from the capital Phnom Penh, Sihanoukville is one of four cities in Cambodia and is the youngest city of this nation. Sihanoukville is a port city with the only deep-water port in Cambodia, a resort town in Southeast Asian region. 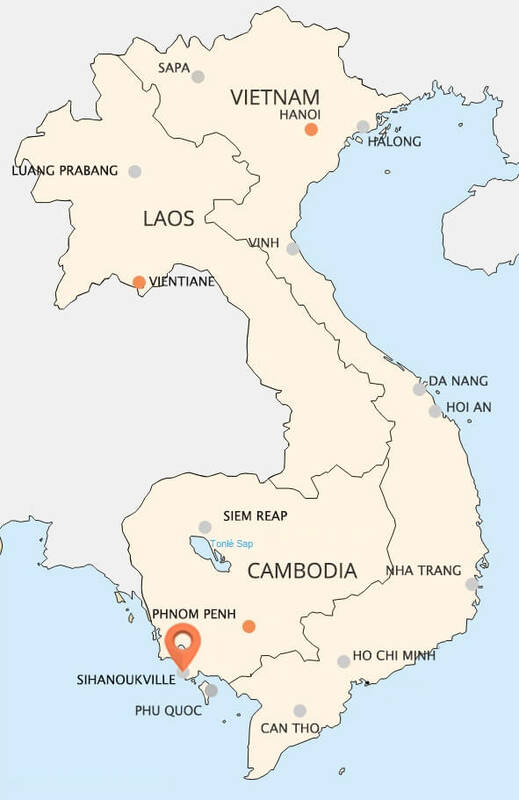 When deep seaport project was completed in 1964, the Kampong Som city was renamed as Sihanoukville - Sihanouk city, under the name of the the contemporary Führer of Cambodia. 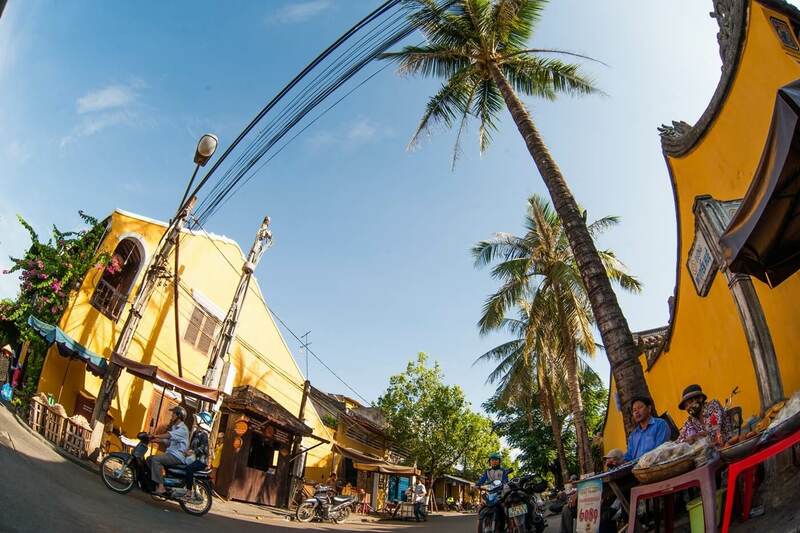 Sihanouk city has an area of 868km², surrounded by beaches with rising palm trees and a dozen of offshore islands, with forest in the west and south of the city, the downtown areas of the port are located in thenorthwest. 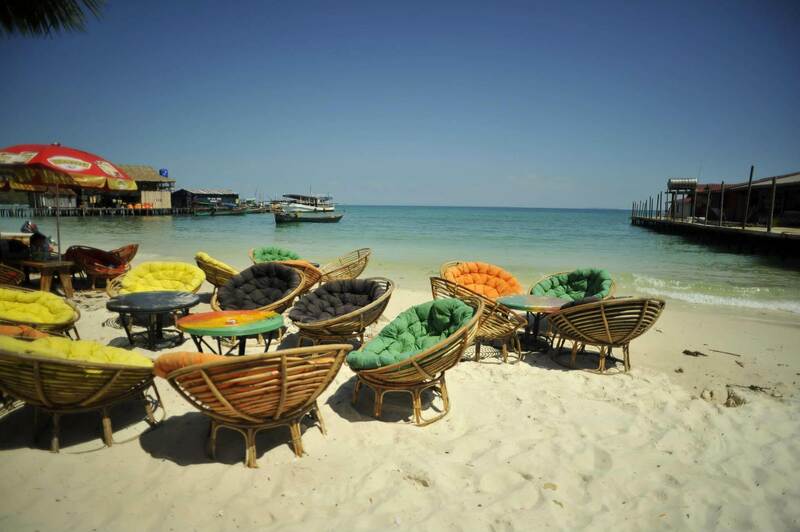 Sihanoukville possesses beautiful beaches from south to north, surrounding the city include Victory Beach, Lamherkay Beach, Koh Pos Beach, Independence Beach, Sokha Beach, Serendipity Beach, Ochheuteal Beach and Otres Beach. Because beaches here have arc shapes so the sea is really peaceful, has white sand and there are no piece of seashell, shell, rubble and broken pieces of coral on the shore. Surround Sihanoukville also has more than a dozen of islands, a few hundred yards from shore if they are close but if far away, it may take a few hours by boat. Kbal Chhay Waterfall is located in Khan Prey Nup, about 16 kilometers to the north from the center of Nha Trang City. Kbal Chhay was discovered in 1960, with a height of 14 meters, there are many sources but only three sources are visible. Kbal Chhay Waterfall of Sihanoukville, Cambodia is really an attractive destination with a magnificent and poetic beauty. It is the complex of waterfalls with the height from 3 meters to 5 meters, are derived from various sources along the mountains. This waterfall formerly known as Kompong Som. Kbal Chhay is the most beautiful waterfall in the rainy season, when supplied with copious amounts of water from upstream by the heavy rains of the tropical climate. Visitors are not only impressed by the spectacular beauty of the waterfalls but also by clear waters and peaceful landscape of nature. This place is also filming location of many famous film of Cambodia. Visit Kbal Chhay, visitors will have chance to taste foods and drinks with materials from this waterfall and they are really delicious. Weather Station Hill, also known as Victory Hill, Port Hill or The Hill, is one of the famous hills with many entertainment activities at night in Cambodia. 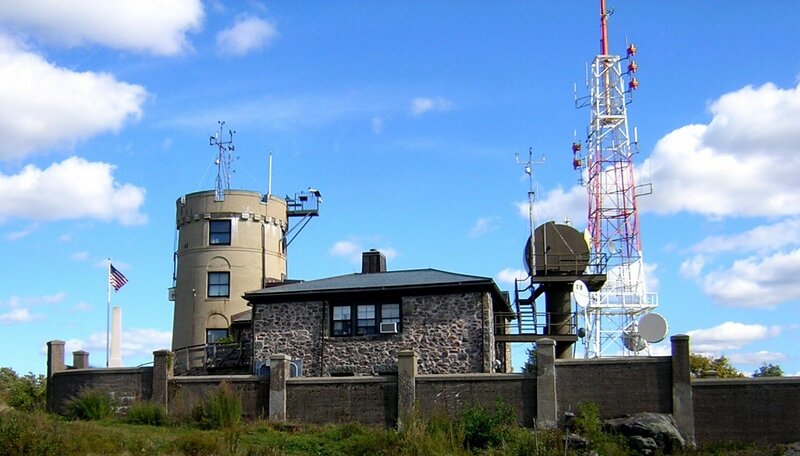 Located above the beautiful beaches Victory, the Weather Station Hill attracts visitors with lively and bustling bars, especially for ordinary travelers. Most tourism businesses in this hill are serving the needs of the majority of ordinary tourists. From the hillside to the top of the hill there are many hostels, midrange hotels, bars, CD shops, internet shop,... With soft prices and good relative quality of service, the Weather Station Hill has become attractive tourist destinations in Cambodia. The number of tourists comes here quite crowded so the peak of Victory Hill is rated as one of the fastest growth of bars, restaurants. On the Ekareach way up to the hill, there are bars and pub which are opened throughout the night. The landscape here is extremely romantic. From the top of this hill, visitors will be immersed in the vast space with horizon far away, the white sand beaches below, and surround them is the vibrant green color of plants. Koh Rong Samloem Island is located about 2 km from Sihanoukville, just takes tourists 45 minutes to get there by canoe. This is a beautiful island, was “touched” by tourism service sector very softly, so it still remain unchanged fresh beauty of the nature of marine region. Lives in Koh Rong Samloem are almost isolated from the outside world. There is no internet, electricity is supplied by generators opened in stipulated time. In Robinson seaside, in the forests of the island there are bungalows of three French guys called Huba Huba, which provide a lot of interesting entertainment services. 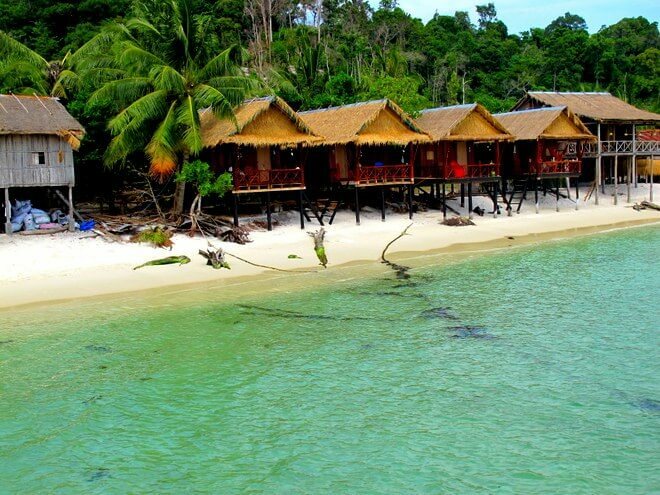 Come to Koh Rong Samloem Island, you just can read books, go sea bathing, dive to watch coral and fishes. Wear the green color of emerald, sea here always clear. Visitors can look down to the bottom and see the fish swimming below it. If you enjoy the gentle ocean or do not want to move much, you should beach select resorts in Sunrise Beach. This beach is located right at the dock on the island. Or if you prefer the excitement and big waves, go to Sunset beach, the waves here will really make you satisfied. 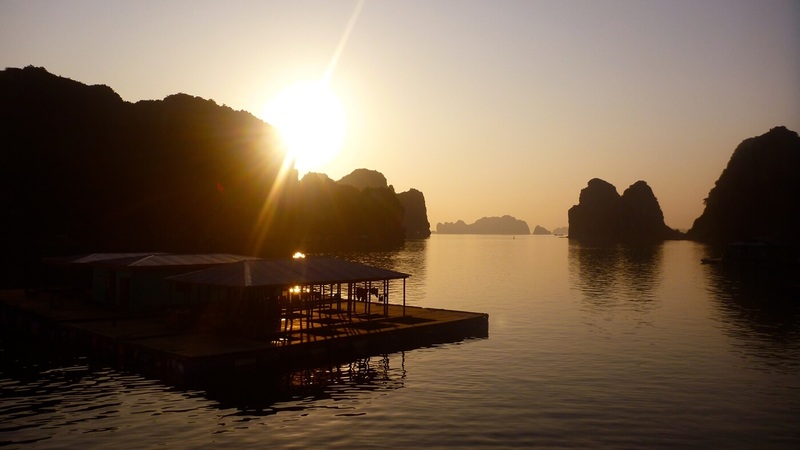 Tourism of Cambodia recently is very popular among international travelers by the wild beauty and not too much commercialism as the other famous tourist attractions. Otres Beach, the beautiful beaches of Cambodia, is also one of the destinations are attracting lots of visitors to relax. Otres Beach is the next beach on the south shore of the Ochheuteal beach and very similar to Ochheuteal but much more pristine. There are no hotels or upscale restaurants, Otres beach only has wild beauty with blue waters and fine sand beaches attach legs of tourists when coming here. Perhaps that is the reason why tourists can easily feel the peaceful, relaxed not hustle at this place. The village and the temple of Otres are just located only one kilometer from the beach so if tourists want to learn more about the lives of the indigenous people, they can get there via the route from Ochheuteal hill. The lives of the people here are mainly based on fishing and seafood business and small tourism services but having pretty good quality. There are many beaches like Otres beache in Cambodia, small but having beautiful and charming scene, further are not too noisy and suffered by human impact. So visitors who like backpacking or just want a quiet space often choose Otres beach. Ream National Park is one of the most popular tourist destinations in Cambodia. Ream National Park is famous for its quite large area. This park spreads over 15,000 hectares of inland and 6,000 hectares of waters. 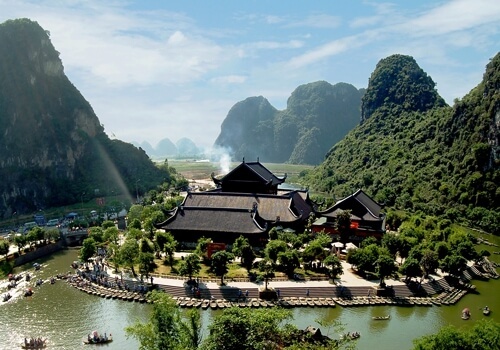 It is located on the territory of Ream so the park has been called Ream National Park. But it is also known as the name “Preah Sihanouk” because of being sponsored in all activities by King Norodom Sihanouk. Visit the park visitors will feel the flawless beauty of nature. The beaches which are scattered throughout and along the slopes of the park are pristine beaches with marine flora and fauna, very abundant. The mangrove forest is also place that guests will find interesting. Besides, there are tropical forests, estuary Prek Tuk, the beautiful coral and reefs. All the scenes are bold wild, pristine. Animals of Ream National Park are very much. On the way to explore, travelers easily encounter these animals. The management of the park also recommends for visitors that they should be careful with those traveling through park without guides accompany.